We have a very limited number of ORANGE Vinyl release. 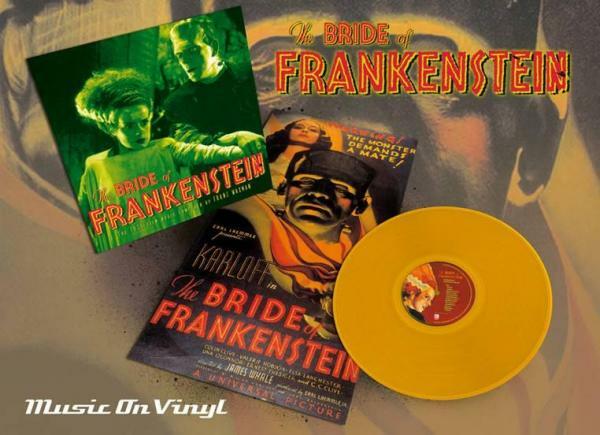 180 GRAM AUDIOPHILE VINYLrn• FIRST VINYL ISSUE OF FRANZ WAXMAN’S FILM SCORE TO THE CLASSIC BRIDE OF FRANKENSTEIN MOVIErn• INCLUDES FOLD OUT MOVIE POSTERrnrnEver since the classic Horror movie genre was at its peak during the pre-WWII era, Mary Shelley’s The Bride Of Frankenstein (1935) starring Boris Karloﬀ still remains the true cream of the crop. The black and white movie, directed by James Whale, is a prime example of how suspense meets great storytelling, the ﬁlm’s thriller elements making it a benchmark for many ﬁlm directors. Its score was written by Franz Waxman, the legendary German-American classic composer with an impressive number of Academy Award Nominations movies to his name. Waxman wrote engaging soundtracks for classic ﬁlms such as Rebecca (1940), Dr. Jekyll & Mr. Hyde (1941), Sunset Boulevard (1950), The Nun’s Story (1959) and many more.